For more information from Elman Technology Law, please click here and complete our contact form. The illustration to the right was inspired by a story written back in 1953. 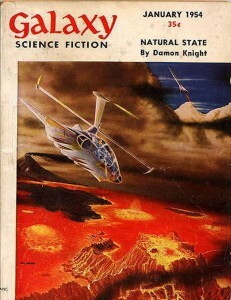 In it, legendary science fiction author Damon Knight wove a futuristic tale in which gene splicing would create a cornu­copia of ecologically sustainable benefits — including such wonders as plants that grow into houses. 1953 was also the year that Watson and Crick identified the double-helix structure of DNA, planting the seed for molecular genetics and subsequent developments in biotechnology. What does that historic moment have to do with Elman Technology Law? Gerry went on to study science and then the law, taking note in 1980 when the Supreme Court held that even a living organism could be the subject of a regular U.S. patent. In 1982, when he founded Biotechnology Law Report with publisher Mary Ann Liebert, Gerry tracked down the story he’d read 28 years before, in which rural agricultural biotechnologists (the “muckfeet”) are at war against city folk whose lives are based on electromechanical technology. In the story, the muckfeet live in houses grown organically, communicate via genetically engineered vines with a nervous system that provides telephony, and transport themselves via genetically engineered big birds. Gerry notes that, at the same time that James Watson and Francis Crick were sussing out the double-helix structure of DNA, Damon Knight conceived for that story the concept of splicing genes to create a biological chimera. Later, Stanley Cohen and Herbert Boyer would develop a tool to realize that dream, the technique of recombinant DNA, that was patented due to the watchful eye of Bertram Rowland (whose recent passing we sadly note) working with Niels Reimers of the Stanford University technology transfer office. Gerry observes wryly that Damon Knight’s story was not among the “prior art” cited during the prosecution of the Cohen-Boyer patents. Technological progress is kindled by vision, but innovation in the real world requires the fuel of resources as well. With the tools of legal protection, visionaries gain the leverage to deploy such resources. That’s where the attorneys of Elman Technology Law step in, with Strategic Lawyering … providing guidance on how to make your projects real, while wielding the tools to obtain protection for your valuable ideas. At Elman Technology Law, Strategic Lawyering is a collaborative process. We strive to apply the tools of the law to mesh with the innovator’s strategic goals, seeking to intertwine our efforts with those of each client. Yes, like the strands of the double helix of DNA. Cultivating Innovation reflects the organic nature of change and reminds us that our function is to nurture not only the mental acts of invention but also its implementation in the real world. As the legal environment for innovation is transformed, we remain vigilant and continually seek to help clients develop an overall strategy for deploying intellectual property and other implements of the law to maximize long-term business value. And by reading science fiction, we stretch our minds towards a vision of the future that we, as technologists, then help to engender. For Gerry’s retrospective on 30 years of biotechnology law, see his article in the October 1, 2011 issue of GEN, Genetic Engineering & Biotechnology News, including a video interview. In Damon Knight’s story, the rural biotechnologists win the war with hostile urbanites by splicing genes into a microbe to get it to gobble up copper—thereby destroying the technological infrastructure by which the city people communicate. The tale reminds us to maintain vigilance against the development of biotechnological agents of mass destruction. And, says Gerry, we should heed the vulnerability of our technological infrastructure to other kinds of viruses and even intentional intrusion by enemy agents. He spoke on this subject July 13, 2011, at the IT Experts Data Security Summit sponsored by INetU at Penn State Great Valley in Malvern, PA. His topic was: Are You Legally Prepared for The Coming Cyberwar? Contact Gerry for further information. 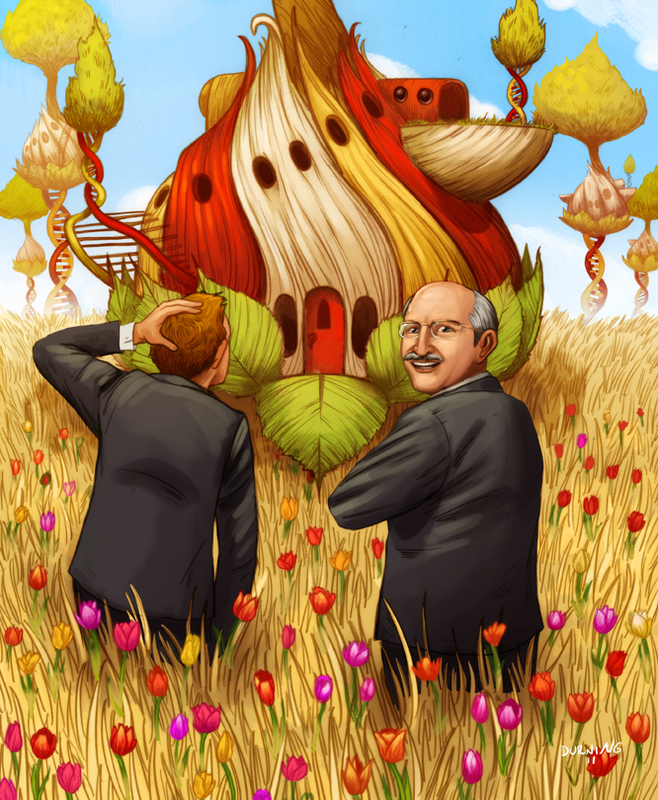 The illustration shown above that visualizes Damon Knight’s “house plant” is part of Elman Technology Law’s full-page message on the back cover of Biotechnology Law Report, June 2011. Created by Philadelphia artist Tim Durning, the image shows Gerry Elman transported as if in a dream to the world of Natural State, where he explains to a puzzled bystander that a “house plant” is a plant that grows into a house. This was the vision of Damon Knight, who conceived of a world where plants might replace machines for producing material goods and, in a sustainable ecology, more often would be the goods themselves. Knight’s vision contributed to Gerry’s future-directed orientation, energizing his career in patent and biotechnology law. This illustration appears on the back cover of Biotechnology Law Report, June 2011 and with Gerry’s article in the October 1, 2011 issue of GEN: Genetic Engineering & Biotechnology News.